'El Día de Todos los Santos', or All Saint’s Day, is a Spanish national holiday that’s celebrated on November 1st in accordance with the catholic tradition that traces back to at least the seventh century. Throughout Spain, different regional customs mark this day. However, as with all good holidays, one thing remains constant: the confection and consumption of the traditional sweets that hail the arrival of this autumnal event. For many people, Halloween – whose name derives from the 16th century phrase ‘All Hallows Eve’ - is the epitome of all things sweet. This holiday has come a long way from its roots many centuries ago and is now associated all over the world with costumes, haunted houses, cackling jack-o-lanterns, and candy, lots of candy. In Spain however, most people look forward to satisfying their sweet tooth just one day later on All Saint’s Day, a holiday that’s sometimes referred to as All Hallows. With a centuries-old tradition of typical sweets that are prepared on and around this day, El Día de Todos los Santos has enough sugar to make Halloween blush and even a spookily named sweet (saint’s bones) for good measure. Given that All Saint’s Day is celebrated throughout Spain, it’s no surprise that different regions have developed diverse gastronomic traditions for marking this occasion. In Extremadura, dulce de membrillo(sweet quince) is commonly eaten with toasted chestnuts, acorns or other nuts. Pestiños, which are typical in Andalusia, are made with flour, olive oil and sugar, and sometimes lemon, honey or sherry. They are then folded and fried like little bundles. Another sweet seasonal dish from Andalusia, and particularly Córdoba, is gachas de leche, which is made from flour, milk and either honey or sugar, and flavored with anise, cinnamon and lemon. The dumpling-like gachas are covered in milk and slightly resemble porridge. The most typical treats by far on this day, however, are huesos de santo, buñuelos and panellets. The first two confections are perhaps the most universally consumed in Spain on this holiday, while panellets are more typical to Catalonia. The appropriately – albeit somewhat gruesomely – named huesos de santo (saint’s bones), do in fact resemble reliquary bones. These slender, often whitish tubes are about 5-6cm in length and are ridged on the outside and hollow within. José Fernández-Ramos, the owner and pastry chef of the exquisite Nunos Pastelería in Madrid, makes the outer cylinder by blanching Spanish Marcona almonds in syrup. 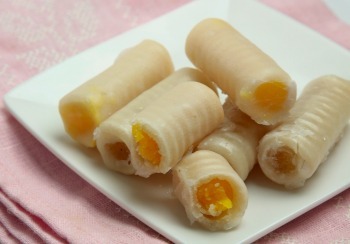 This results in fine marzipan dough that is then molded, filled and covered in a sugary glaze. The most traditional ’marrow’ is yema (sweetened egg yolk), although other popular variations include sweet squash, coconut, plum and chocolate. See our recipe for home-made huesos de santo, and discover this typical Spanish treat at home. 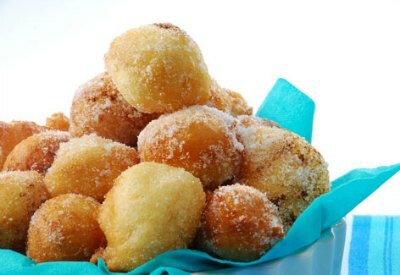 Buñuelos are essentially dough balls made with flour, butter (or lard) and eggs and deep fried in oil. 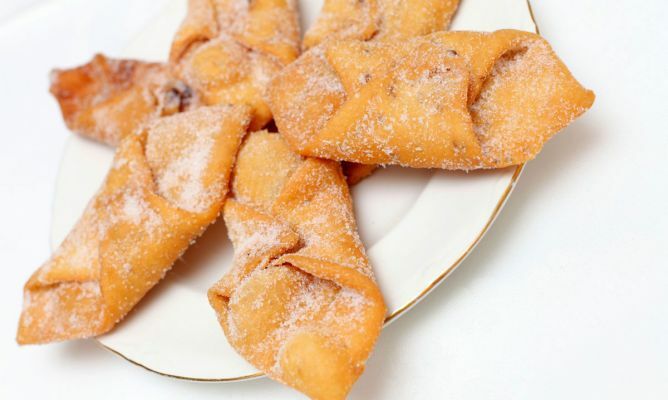 Also called buñuelos de viento(meaning ‘puffed up’), the origins of these doughy sweets are often attributed to a tenth century Sephardic dish called bimuelos that was later adopted for the catholic saint’s day tradition. Other sources attribute these confections to the Moors who ate them fried in oil and then dipped in honey. Despite this long and varied history, the origin of buñuelos as we know them today is generally associated with old Madrid, where they were once served alongside churros in traditional shops and cafes. Today, buñuelos are a less sweet and more affordable alternative to huesos de santo, and are also easier for people to make at home. The dough balls are around the size of a ping-pong ball and are frequently filled with cream and other delights. Before saying goodbye to the traditional Spanish sweets of All Saint’s Day, however, it’s essential to try the panellets. Today’s style of panellets originated in the 18th century, at which time it was customary to bring them to lengthy church services, wakes and funerals to share with friends and neighbors. Even so, their marzipan base (made with almonds, sugar, egg whites and lemon zest), also recalls the gastronomic influence of the Moors. These confections are particularly associated with Cataluña, but are also common in Valencia and the Balearic Islands. Panellets are usually round, although the marzipan makes them easy to shape into less traditional forms. They are rolled or covered in different coatings, with the most traditional being pine nuts. Other common varieties include almonds, coconut, chocolate (cocoa powder), coffee, hazelnut, chestnut, yema, quince, lemon and cherry. 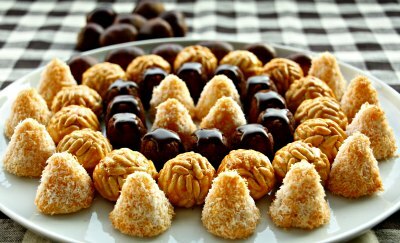 To mark All Saint’s Day, panellets are usually made starting on October 15, and in Cataluña are often accompanied by Cava or sweet moscatel wine. Whether pestiños, huesos de santo, buñuelos or panellets, the November 1st holiday is definitely the time to sharpen your sweet tooth on these traditional confections. Unfortunately, they’ll be gone before you know it!